Directions (1 – 5): The following questions are accompanied by three statements I, II and III. You have to determine which statement is/are sufficient to answer the questions. A and B together can complete the work in how many days? I) A alone can complete the work in 12 days. II) B alone can complete the work in 18 days. III) A and B together can complete (5/6)th of the work in 6 days. Both I and II are sufficient to answer the question. Statement III alone are sufficient to answer the question. Find the perimeter of square, whose side is 4 meter less than the length of the rectangle? I) The ratio between the length to that of breadth of the rectangle is 3: 2. II) The perimeter of the rectangle is 80 meter. III) The area of the rectangle is 384 Sq meter. Both I and III are sufficient to answer the question. Both II and III are sufficient to answer the question. Hence, any of the three statements are necessary to answer the given question. Find the present age of Sanu? I) 5 years ago, the ratio of age of Kathir and Sanu is 3: 2. II) After 7 years, the ratio of age of Kathir and Sanu will be 21: 16. III) The difference between the age of Kathir and Sanu is 10 years. 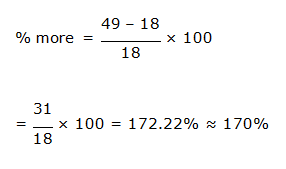 Find the speed of train B (in km/hr)? I) Train A crosses 150 m long train B running in opposite directions in 18 sec. II) The speed of train A is 50 km/hr. Hence, all three statements are required to answer the question. What is speed of the boat in still water? 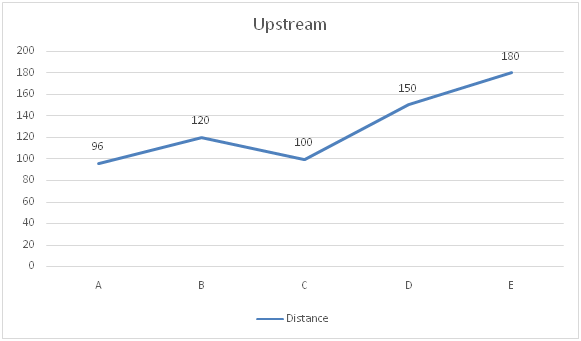 II) The boat takes 2 hours more to travel same distance upstream. 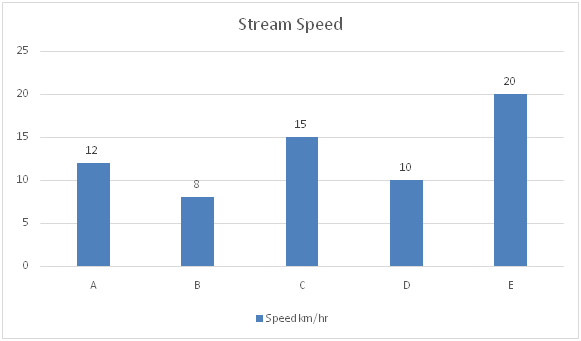 III) The ratio of speed of boat in still water to that of stream is 7: 1. Hence, either I and II or I and III are sufficient to answer the given questions. 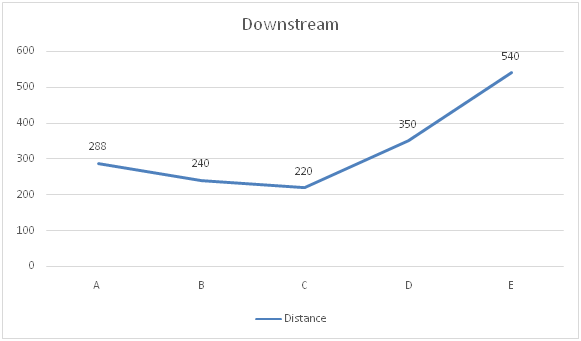 Directions (6 – 10): The two-line graph shows the distance travelled by the five different boats with the stream and against the stream in same time and the bar chart shows speed of stream. 6. Find out the speed of Boat B & D together in still water is approximately how much percentage more/less than that of speed of stream of the same boats together? 7. It is known that ratio of the speed of the Boat B to Boat F in the still water is 4:5. If it’s given that Boat F travels 126 km distance with the stream, and 81 km against the stream in 7 hr 30 min, what is the speed of stream for Boat F? 8. It’s known that distance between the two-point M & N is 210 km. Boat E travels from point M to N and Comes back. What is the time taken by Boat E in travelling total distance? 9. Captain of the Boat thought of increasing the speed of Boat C and so in still water speed of boat is increased by 10% and stream also started flowing fast, increasing its speed by 20% due to wind. Find the time taken by the Boat C to cover 91km distance against the stream. 10. Find the ratio of the speed of Boats A and B together in still water to the speed of Boats D and E together in still water. 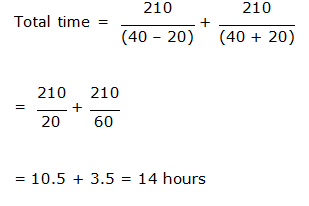 1) A and B together can complete the work in how many days? 2) Find the perimeter of square, whose side is 4 meter less than the length of the rectangle? 3) Find the present age of Sanu? 4) Find the speed of train B (in km/hr)? 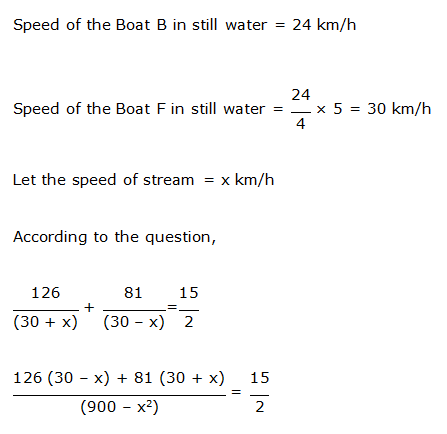 5) What is speed of the boat in still water? 6) Find out the speed of Boat B & D together in still water is approximately how much percentage more/less than that of speed of stream of the same boats together? 7) It is known that ratio of the speed of the Boat B to Boat F in the still water is 4:5. If it’s given that Boat F travels 126 km distance with the stream, and 81 km against the stream in 7 hr 30 min, what is the speed of stream for Boat F? 8) It’s known that distance between the two-point M & N is 210 km. Boat E travels from point M to N and Comes back. What is the time taken by Boat E in travelling total distance? 9) Captain of the Boat thought of increasing the speed of Boat C and so in still water speed of boat is increased by 10% and stream also started flowing fast, increasing its speed by 20% due to wind. Find the time taken by the Boat C to cover 91km distance against the stream. 10) Find the ratio of the speed of Boats A and B together in still water to the speed of Boats D and E together in still water.